9th June, 2014: FISHING REPORT: Port Alberni Inlet, Barkley Sound, Ucluelet (West Coast), Somas-Stamp River System. It is now the beginning of June and the weather is terrific on the West Coast of Vancouver Island. Along with the current fantastic weather conditions the salmon fishing has been very good close to Ucluelet Harbour and offshore Ucluelet which is located on the extreme west coast of Vancouver Island British Columbia. The fishing in various surf line areas of Barkley Sound has also been quite good and the early sockeye salmon have already started their long return from somewhere in the North Pacific to the Somass River in fairly good numbers. There have been a few third hand reports that a sport fishermen camping at the China Creek site had some luck picking up a few sockeye in the Nahmint-Franklin area in 25 to 30 feet of water. If the story is true these fish would have been more than likely in a big school but moving quickly towards the fresh and very cool waters of the Somass River. With the good weather and high afternoon temperatures the Sockeye Migration will slow down as the water temperature in the river and the Alberni Inlet warm up. This will possibly help the Sport Sockeye season get underway in the inlet a little earlier than normal. Salmon and halibut fishing on the west coast have been consistent over the past few weeks. The great fishing in local hotspots is very evident by the increase of vehicles on local roads and highways towing a variety of sport fishing boats. Many fisher persons are either fishing the scenic and pristine waters of Barkley Sound or are travelling out to the west coast to fish close to Vancouver Island’s rugged coastline or in offshore locations. The 2014 sport salmon fishing season in Ucluelet, Barkley Sound, and the Port Alberni Inlet is forecast once again to be terrific. In fact this year is predicted to be one of the best seasons in many years. On the west coast the early summer run of Chinook which are currently migrating down the Vancouver Island coastline and stay fairly close to the beach will soon peak and will be followed by what is supposed to be one of the biggest mid summer Chinook returns to southern watersheds. Chinook and Coho numbers returning to the Columbia River and Bonneville dam where numbers of returning salmon have been recorded since 1938 are predicted that this years’ Chinook and Coho numbers will be the largest return ever. Chinook returns are predicted to be 1.6 million and Coho just over 1 million. The Sockeye fishing should be extremely good. The return to the Somass River is a record 1.6 million in early season forecasts. The early run has already been swimming into the Somass River. Don’t miss out on a fabulous 2014 sport salmon fishing year in the Alberni Inlet, Barkley Sound, or inshore offshore Ucluelet-Tofino. The Sockeye sport fishery has been open since the first of May in the Alberni Inlet. Limits are four per person per day. That number should remain the same throughout the season. Sockeye usually school in the Inlet when the water of the Somass River and the Inlet warms to 18 degrees Celsius. When there are big numbers of Sockeye entering the system the schools will hold in the inlet for the salmon ahead to push into the river. The river water is really warming up and with very little snow in the nearby hills it will not take much for the Somass to reach eighteen degrees. The Sockeye that are currently in the system and have come up from Barkley Sound and into the Inlet are swimming in fairly shallow water. Those sport fishermen out fishing will ideally during the next week have the best success fishing the Nahmint-Franklin area, the narrows, and perhaps Cous Creek or right in the Port Alberni Harbor trolling from 25 to 40 feet. The late May and early June warm weather conditions will help fairly good Sockeye fishing get underway by approximately the 13th of June. It is often safe to say that June 15th is the time to start fishing Sockeye. We are hoping that by mid month sport anglers are landing limits of Sockeye while fishing the Alberni Inlet water. Sport guides and individual fishermen will find good numbers of Sockeye Salmon at hotspots such as Cous Creek, Dusmuir Point, the China Creek Wall, the slide, and the narrows. Sockeye are attracted to color and having six or even eight flashers hooked to the deep line is not unusual. The most popular lures for Sockeye are the mp 2 and 16 also the bubblegum colored mp 15 hootchies. Leader lengths are best at 22 to 27 inches behind a green or red glow hotspot flasher. The Salmon fishing in Barkley Sound especially out at surf line locations has been also relatively consistent over the past few weeks. Many areas have had big bait balls which will bring those migratory Chinook swimming close to the beach in to feed on the very rich resources of bait fish. Over the past week Effingham has had some good fishing as has Vernon Bay and Alan Point. 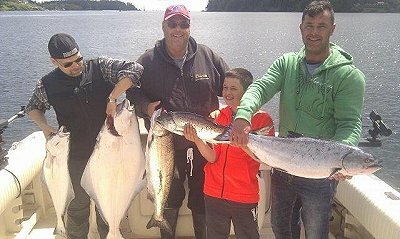 Bamfield areas such as Kirby in the morning and Edward King later in the day and also the Wall have reported some nice fish being landed by guides and sport anglers. The best results have been fishing from 80 to 120 feet depending on location but it is important that you are fishing where there is bait. It seems that choice of lure really does not seem to matter as many have been using a variety of spoons, plastic, and bait. The best spoons have been the four inch green and blue nickel coyote spoon behind a green glow hotspot flasher. The four inch Irish Cream spoon behind a chartreuse flasher and the 155 needlefish have both been very good. Anchovy in a green UV teaser head and also in chartreuse have been hot at various times. Many of the salmon have been in the mid to high teens with a few in the low twenties. We are expecting the fish to get bigger as the mid-summer run which will get underway in the latter half of June will have a good number of four and five year olds. Barkly Sound should be a hotbed for fishing this summer especially out in surf line locations. Ucluelet is often referred to as Vancouver Island’s premier salmon and halibut sport fishing destination. 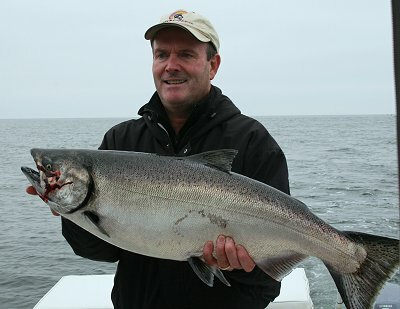 Like Barkley Sound the waters inshore and offshore from the Ucluelet Harbor offer some world class fishing. The water is very rich in bait fish (sardines and needlefish) which the salmon feed on throughout the spring and summer months. The summer salmon fishing seems to be changing. 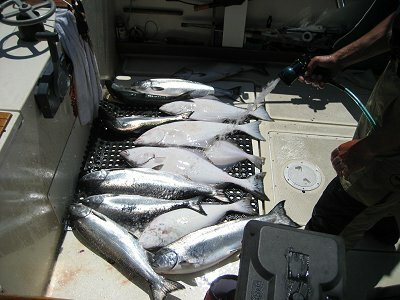 August and early September were often considered peak times for Chinook and Coho sport fishing. With the high numbers of transient Chinook salmon passing along the west coast of Vancouver Island from April to August it often seems that the peak of the season is in the month of July. This is not to say that Chinook sport fishing does not continue in August and September. Coho which were often referred to as the number one sport salmon along coastal fishing locations in B.C. are a major highlight in late August through September. This thought is something to consider when thinking about and organizing sport salmon fishing this summer. The Ucluelet fishing has been very consistent over the past few weeks with some good fishing out at the inner and outer South Bank. 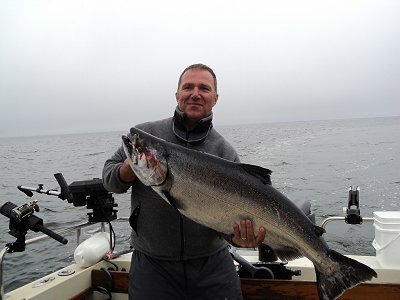 Mara Rock, Great Bear, Sail Rock, and The Lighthouse which are all very close to the Ucluelet Harbor have also been excellent choices for sport fishing especially on those days where the weather has not co-operated for boats to get out a little offshore.. The largest salmon have been averaging twelve to eighteen pounds. The largest landed to date by guides and guests hit twenty-six pounds landed at Sail Rock. This Chinook which like many of the other salmon was a hatchery fish and hit a needlefish hootchie. The fish out at the inner and outer South Bank have been close to the bottom between 130 and 160 feet. Guide Al has done extremely well on salmon and halibut with his largest hali for guests at forty-five pounds. The best lures to date have been a T-Rex hootchie and an iridescent Turd and also a few different spoons in brass/copper or four and five inch blue and green nickel. Other guides and sport anglers have had great success using needle fish hootchies behind a flasher. The needle fish will hide in the sand and on tide changes will come up to higher levels which creates a very good salmon and halibut bite. If trolling and using anchovy it seems that a green or red glow hotspot flasher with a green or army truck rhys davis teaser anchovy head with six feet of leader are working well. One important thing to remember is that during the season the food sources often get bigger and when using spoons and plugs the sizes should increase as the bait does. The Stamp River is one of B.C.’s healthiest river systems. The salmon fishing this year will open on or about August 25th with what is forecast to be a better than normal season. Retention at the moment is forecast to be two Coho and two Chinook. The season begins with river anglers using wool, spinners, and plugs. The bait ban should be lifted on the 15th of September. For those that enjoy Steelhead fishing there are three runs of Steelhead in the Stamp. Summer and Fall Steelhead and then later in late November the Winter Steelhead begin to show. October and November are perfect months for summer and fall fish. The Steelhead actively feed during the natural spawn of the salmon in the river which is during October and well into November. There is plenty of opportunity to fish the Stamp but all arrangements for trips that are guided should be organized very early in the summer or late spring. Fishing for Sockeye along the banks will begin very quickly….